Happy Birthday!! Today you would have been 66 years old. Words cannot express how much my heart aches to hear your voice again. So much has happened in the past few years. It had been a long struggle but this past May I finally graduated college with my degree in English and my minor in Japanese. I know you always pushed me to do my best. 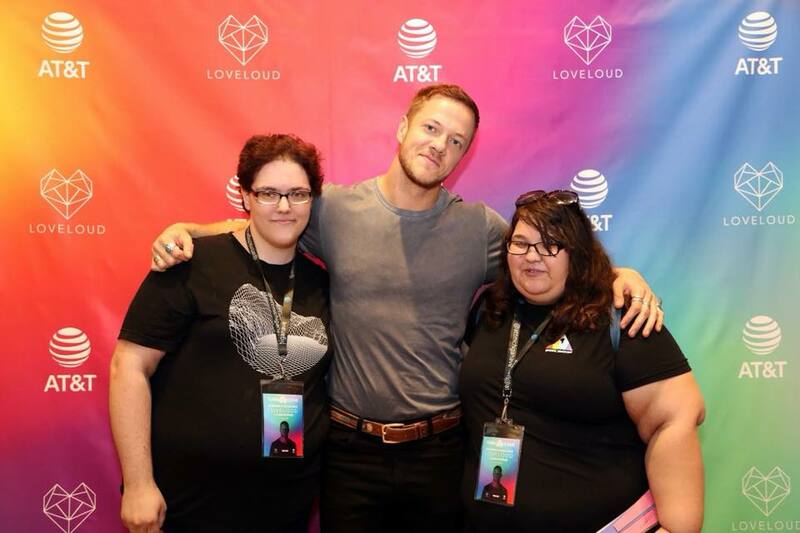 In July, I got to meet Dan Reynolds from a band I really like called Imagine Dragons. You would like their music a lot Mom. I also got a better job starting off as a teaching assistant and hopefully will get my own classroom. I have been living with Brandon for a while now, but now we live in a 2 bedroom 2 bath apartment. Brandon was kind of enough to let me turn the second bedroom into my own office. I like it because I can sit in here and read, or I can write down my own thoughts. I sometimes sit in here and look at your photo on my desk. I remember the times you would encourage me to continue to write stories, and continue to express myself through writing. You were always so amazing in the way you supported me and I am sorry that I realized that too late. I hope that you can see to forgive me during the hardships I have caused you. Thank you for everything that you done. In January, I am going with an organization I joined to Texas to tour some schools. Who knew that I would love working in an elementary school just like you did when you were around my age. I try to hold onto your kindness as much as possible so I can give it back to the children, but make sure I am firm when I need to be. I am so much like you Mom in so many ways, but I wish I had noticed before you had passed away. I had no idea you had a love for different languages, and was fluent in Spanish because you took it in college. I loved that you encouraged me to learn a different language. I remember you telling everyone at family events that I was taken Japanese, and that I could speak it. You truly were proud of me. Thank you for all the sacrifices you made through out my life. Even when you did not have a lot of money, you still made sure I got what I want or something close to it. I did not appreciate it back then but I hope you know that I appreciate everything now. You taught me to be thankful for everything that is given to me, and to not be greedy. Sometimes when I hear a quote in a movie that resonates with me, I think it is something that you would have told me. I am not sure what the future holds for me. I know there is still a long bumpy road but I wanted to write a small letter to you. To this day, my heart aches, and I still feel like there is a missing piece. There's just this hole, and no matter what I do, I can't seem to fill it. I get so annoyed with myself bothering people with my grief, and then I get upset when they seem to just brush it off but I know it is because they do not know how it feels to lose the one person closest to them. Mom, I miss you so much. I see the sun shining, and when I was crying it was shining even brighter. I knew that was you telling me to stop crying. I am doing my best to stay strong, and I will continue to live my life to make others lives better, but no worries because I will continue to take care of myself too. As promised, I said I would keep up with blogging and at least fill you guys in with how my life is going. This week has been busy to say the least, but as I have been telling my fellow colleagues that if you leave with unconditional love, then you know you are in the right place. My week started off pretty normal. I was given a new schedule to go by so this way I can split up my help between the first grade classes. I think that it will take some time to get use to but I find that the schedule flows well. I did end up having to sub for a class a couple days which I have no problems doing. I feel as a teacher myself that I am growing, and being more firm when I need to be, but also maintaining love among the students. I also have found ways to improvise when some things ended up not going as planned. Brandon's birthday is tomorrow!!! I am so excited because for once I am not working on the day of his birthday. It was always like that so I missed out on going to lunch with him. I bought him his present which he ended up spoiling for himself. 😡 I had it delivered and noticed that "someone" signed for it, but wanted him to CALL the office to make sure that it was delivered as we had a few packages go missing, and he checked on amazon. I ended up going myself and finding out that it was indeed there, but the person who it said signed, did not really sign....that's a whole different headache. Anyways, Brandon is always using his space on his ps4, so I bought him a 2TB hard drive for it. I told him he has to be 86 before that memory runs out. The holidays are coming up also, and I am very excited. I use to not care for Christmas or any other holidays but this year I have been super excited. We have our tree up, but still have to add on our last bunch of ornaments. We are also having 2 full weeks off from work. I am not sure if I am ready for that yet. I had Thanksgiving off too, which felt nice to spend with good company. I am also excited to be able to buy gifts for people this year!! In January, I am going to be heading off to Houston, Texas! I am going with an immersion program, and I am very excited because I am able to use this opportunity to grow as a teacher, but also to bring back what I have learned to my colleagues. Right now, I am just relaxing, and writing a snail mail letter and Christmas card to my penpal in Japan before I head off to bed. Tomorrow we are going to have dinner with Brandon's Mom. I hope you all have a great day/evening and keep shining! Where should I begin? I know it has been some time since the last time I blogged. The last time was in July. I have done a few live streams here and there, but somehow I wasn't able to keep them consistent since my job started. I guess it took me longer to adjust to this new job than planned. A lot has happened since then. The first is that Brandon and I are moving to another apartment. A better one. I'll be doing an apartment tour soon after everything is put together. I'm thinking maybe the first week of October. The apartment is really nice. It's a two bedroom two bath apartment with a private entry way! I'm so thankful that we are able to afford this. We will also have better internet! I'm so excited to have better internet. Why the sudden move? Originally, we were going to hold out until we could get a house, but we had some visitors. About 4am in the morning on a Friday, we had the police department banging at our door. Apparently, they were looking for someone that just so happened to have the same last name as me. After getting them to leave the first time, I try to navigate in my dark apartment with my flashlight on my phone and they found that to be suspicious so they came up and decided to search the apartment.We let them in, but I could tell when they saw just me, they realized that they had the wrong place. I did happen to see though that a "Smith" that wasn't mine pop up on our wifi listings so that may be the person they were looking for. Either way, we were NOT happy at all. Also, this apartment had just became too crowded for two people. We decided to set off to look for another apartment. Luckily, we found our new home on the second try. The first one we looked at was similar but it just lacked....a lot. There was no home vibe for me. We then toured our second place, and being encouraged to decorate, and do whatever made us happy. Also, the amenities were really nice. However, it's smaller things that I am thankful about in this new place. The first one being the washer and dryer unit IN the apartment. No more going beyond "quiet time" hours to do laundry, and no walking to a second building to do our laundry. We also have a dishwasher which will take less stress on us having to hand wash our dishes. An area for a kitchen table for us to sit down and eat dinner, and a comfy living room for us to spend time together. For me, it's having an office to work in. I'm so excited to be able to have this personal space of mine. Brandon was so nice to give it to me, and I told him I'll keep all my clothes and such in it, so he could have the master bedroom closet. So I'll have my own little space which makes me super happy! Also, our kitchen is big enough to make healthy wholesome food! I ordered a new cook book that should arrive when we're there. I also have have a space where I can possibly do more vlogs! Other than that, the new job is going great. Expect more after I move! So, it has been quite an eventful past week. I honestly did not expect to meet Dan Reynolds face to face, and honestly, I felt bad because I was really nervous keeping eye contact. I remember, I had just finished watching his HBO documentary and decided to support Loveloud and bought a shirt since I could in no way be able to see him in Salt Lake city during the festival. I went to work, and happen to to see this event pop up on my instagram that was being hosted by AT&T and at first I was like "I'm not going to win this" but something kept nagging me. So I entered. I got my notification a day or two before hand. It then hit me that I had to drive to Indiana the next day. I shrugged, and said it be too much of an opportunity to miss. So, my friend and I went to the event. We get there, and met some pretty cool people. We also got told that 10 people would be able to meet and take a photo with Dan Reynolds. Again, I thought that my luck had stopped there but I tried anyways. I ended up being the 8th called, and I was in disbelief to the point I was shaking. Needless to say, I blubbered like a baby because well, his band honestly has helped me a lot. Especially with coping with healing from my Mother's death, my father kicking me out, and managing to get through school. I felt bad because it looked like that was going to make him cry but then quickly said that I fortunately had a safe place to fall. It felt great to be able to thank one of my artist for all that they have done, because music is a big part of my life. However, let's talk about what the event is really about, and I will link down the website(s) below so if anyone is interested, they can volunteer. In short, Dan found flaws in the way the Mormon community was ran. Please hear me out before you get angry and type hateful comments. The suicide rate in LGTBQ+ community is astronomically high among teens, or people in general, so I want to help bring awareness to these organizations causes. During the Q&A sessions, I did want to bring up conversion therapy, but thought best that another question be asked. However, due to time restraints, I could not ask my question and I was short so I couldn't. So, Everyone on the panel suggests that if you are interested in becoming an ally, just ask questions, and talk to people. Please donate, volunteer, ask questions, and don't be afraid to stand up against hate. The next day I went to Panic! At The Disco in Indianapolis. I was needless to say super tired, but I had been able to rest the following day after the concert and slept in at my friend's house. After that, I decided to stay into town and spend time with my Mother's family. It was so amazing to see my aunt and uncles again, and to learn about my Mom's family more. I had missed them so much, and I could tell that they had missed me. However, I want to get serious for a moment, and I'm not going into too much details. I have always wondered why things had happened the way they did, and I will just say that I got my answers, and everything makes so much more sense. If you have seen my instagram, you would know that I had decided to partially cut ties with my father, however, I feel that there was much more that I did not know because I was so young, and my Mom being my Mom, did not tell me these things that have occurred between them two, but I am just going to leave it at that. Please, if you are in an abusive relationship, get help. Get out by any means necessary. I am so thankful that I have been told the truth, and I realized that even though my Father had kicked me out, and I had been up here, he has been still trying to taint my life with this toxic behavior. I am also now, not afraid to mention anything because I use to tiptoe around the subject but honestly, I am just tired, and I don't want to fight anymore. So again, please get help if you feel suicidal, in a bad relationship, or show any signs of wanting to harm yourself. There is help out there. You are not alone, and someone will help you. Sometimes, it's just not in the place we'd expect the help to be. I wish you all a wonderful and peaceful night.